Dr. Mike Robinson, host of Parent Talk Live and his guest K. Alexander Wallace discuss the termination of Prince George’s County Public Schools 6.5 million dollar federally funded Head Start program. Born in District Heights, Maryland, and raised in Upper Marlboro, Maryland, K. Alexander Wallace is a proud product of the Prince George's County Public Schools system. After graduating from Dr. Henry A. Wise, Jr. High School, Mr. Wallace attended and graduated from Towson University with a Bachelor's of Science degree in Political Science and a Communication Studies minor. He currently is enrolled in the University of Baltimore's Graduate School where he is pursuing a Masters of Public Administration with a Public Policy concentration. Throughout his life, K. Alexander Wallace has had the privilege of working with several different non­profits, governmental agencies, community leaders, and elected officials such as The Education Trustin Washington, D.C., both the Maryland Higher Education Commission and University System of Maryland, the Maryland Youth Advisory Council, and Maryland State Senator Ulysses Currie (District 25 ­ Prince George's) where he worked for several years as Senator Currie’s Legislative and Constituent Aide. Over the years, K. Alexander Wallace has advocated for equitable education funding for low income students and students of color, secondary and higher education financial literacy, and community partnerships and engagement in public schools. As a Member of the Prince George’s County Board of Education, Mr. Wallace's main areas of focus are alumni engagement as well as the enhancement of Middle School academic programs and services. Mr. Wallace currently resides in Upper Marlboro, Maryland, and is proud to serve his neighbors in the Board of Education's 7th District, which includes: Upper Marlboro, District Heights, Forestville, Suitland, Coral Hills, Morningside, Capitol Heights, and Temple Hills. 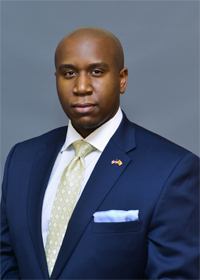 K. Alexander Wallace was appointed by the Prince George's County Executive, Rushern L. Baker, III, in November 2015.